The Smiling Readers of Delmont Library would like the opportunity to share our love of reading with the community. 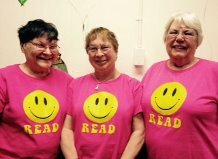 Smiling Readers is a group of library volunteers with clearances willing to come to your local group or organization within a 10 mile radius. Looking for a storytime and activity for your preschool, daycare, senior center, or business? Smiling Readers is a free outreach of the Delmont Public Library, and is available to come to you. We also can provide a Bag of Books. Simply sign up with us for a free library card. Then using your organization’s card we will bring a bag of exciting and interesting materials to use for one month instead of the usual two weeks.